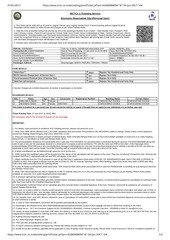 This PDF 1.4 document has been generated by , and has been sent on pdf-archive.com on 17/08/2014 at 08:59, from IP address 110.225.x.x. The current document download page has been viewed 440 times. passenger(s) booked on that ticket, if f ound trav elling in train will be treated as trav elling without ticket and charged accordingly . photograph/Unique Identif ication Card &quot;Aadhaar&quot;. General rules/ Inf ormation f or e-ticket passenger hav e to be studied by the customer f or cancellation &amp; ref und. # Serv ice Charges per e-ticket irrespectiv e of number of passengers on the ticket. 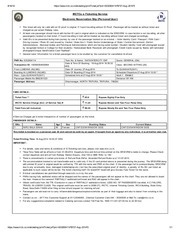 For details, rules and terms &amp; conditions of E-Ticketing serv ices, please v isit www.irctc.co.in. There is amendments in certain prov isions of Ref und Rule.Ref er, Amended Ref und Rules w.e.f 01-07-2013.
applicable to such cases will be lev ied. The ticket checking staf f On board/Of f board will giv e Excess Fare Ticket f or the same. the train. Howev er the namesof PARTIALLY waitlisted/conf irmed and RAC will appear in the chart. Road, New Delhi-110055 af ter f iling on-line ref und request f or claiming ref und. This file has been shared by a user of PDF Archive. Document ID: 00179465.